My great-grandfather, Herman Cunningham, died when I was not quite nine. I don’t have many memories of him, as he lived in Texas and I lived in Colorado. However, I do remember some things, and this post is a biography of my great-grandfather focusing on all of my memories with a bit of what I’ve learned from others. Herman Cunningham was born on March 16, 1895 in Lewisville, Denton County, Texas. The Cunninghams had moved to Texas from Georgia, where Herman’s father Amos Blakey Cunningham, was born. I am not certain when the Cunninghams moved to Georgia, mainly because of the loss of the 1890 Census, but I am certain it was between 1878 and 1894, as Herman’s parents married that year in Collin County, Texas. 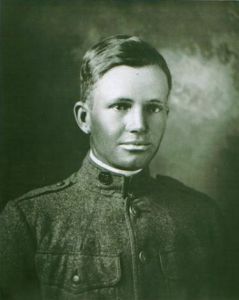 Herman served in the Army in World War I. He spent most of his tour of duty in the hospital with spinal meningitis. My grandfather told me that Herman was one of only two who survived this meningitis outbreak; Herman exchanged Christmas cards with the other survivor for years. Herman met his future wife Annie Jennings while she was boarding at his parents’ house. Annie was a school teacher. Herman and Annie married on June 20, 1920 in Tulia, Swisher County, Texas. The Cunninghams lived in Tulia until 1931; their first three children, Alvin, Udell, and Flois, were all born in Tulia. Nelda Gene and Carolyn were born in Lockney, after the family moved to Floyd County. My dad worked on the W.P.A. He rode a truck to Lubbock where they were making what turned out to be Lubbock Air Field. It is now the municipal airport. Reese Air Base was 10-12 miles west of Lubbock. I can recall visiting my great-grandparents’ farm when I was small. By that time, it was somewhat run down. There was an old windmill that I used to climb with my second cousins, Angie and Misty Bertrand, and there always seemed to be kittens in the barn. All of my great-grandfather’s grandchildren called him Pa Pa, me included. Pa Pa smoked a pipe most of his life. His farm was littered with discarded Prince Albert tobacco cans. Pa Pa used to whittle. He created all kinds of interesting things out of pits, seeds, shells, and bits of wood. I remember he used to hollow out walnut shells so they looked like basket s and glue blue Tic Tacs inside to look like robin’s eggs. He also carved peach pits into tiny baskets. He made tiny owls out of wood and some type of seed or pit I couldn’t identify. My most special memory of Pa Pa involves him taking me out to the side yard personally, and pointing at a hole in the tree. He smiled as I looked inside and found one of his little owls. I remember feeling special to have been singled out for attention from my great-grandfather. I also remember feeling like showing me the owl was a present. I remember Pa Pa’s smile so clearly. My mother reports that Pa Pa only liked orange Kool-Aid, so that was the only flavor Granny (my great-grandmother Annie) would make. I recall when I went to visit them that they always seemed to have those little red hot candies in their candy dish, so Pa Pa must have liked those, too. My great-grandparents’ house was very old. It had no hallways: each room opened into another. It was quite small. My grandfather told me his parents paid $500 for the house some time in the 1930’s. The one feature that stood out to me as a child was that the bathroom had one of those commodes with the tank up high. You had to pull the chain to flush. It was a real novelty to us kids! The house also had a really low-slung tree in the front yard. The trees where I lived were all too tall to climb, but this one was easy to climb. I loved to get into the tree and see how high I could get. I remember how surprised I was when Granny and Pa Pa appeared at the 50th wedding anniversary party of my other great-grandparents, Ted and Lucille Thurman (my grandmother’s parents). It never occurred to me that they knew each other! I realize now how silly this was, as they lived near each other in Lockney for some time and their children had married, but as my own maternal and paternal grandparents had no interaction, I suppose I thought everyone else’s were like that. Pa Pa also used to grow sunflowers. My daughter Maggie, who is currently five, selected sunflowers to grow in her garden this year. We planted them late — about a month ago. I have been watering the flowers every day. They are about a foot tall now. Every time I see sunflowers, I think of my great-grandfather, so he has been much on my mind lately. I do clearly remember going to his funeral. Pa Pa died of emphysema. He was 85. I recall seeing one of those funeral wreaths with a large ribbon that said “Pa Pa” across it. The wreath was near his casket during the viewing, which as a small child, I remembered being somewhat scary and disturbing (hence, my own desire not to have anyone looking at me after I’m gone). I do recall my grandmother and mother crying during the funeral, and I felt very bad that I wasn’t. His was the first funeral I had gone to. I do wish I had been able to know him better, but I suppose not that many people get to know their great-grandparents well, and I was fortunate to have some time with him. Note: This post is Part 1 in a series on grandparents and other relatives I remember personally in my lifetime.